For many of us, it starts November 1st when we stop at the store to pick up something quick for dinner. Overnight it seems that everything has gone from Halloween to the Holidays! Upon returning to your car, you then notice the lampposts are already dawned with wreaths, red ribbons, garlands and lights! What happened to Thanksgiving? This year ,it seems the holiday commercials, store decorations, and TV movies started in October. I think we all say it every year- things are happening earlier and earlier each year. Gone are the days of the world around us waiting until the day after Thanksgiving to begin the holiday season. So, what can we do about it? You may have seen the title of this article and laughed, thinking there is no way to prevent ‘holiday overload’. How can we preserve the real reasons for this time of year, slow things down, keep our stress levels low, and find the joy that this time of year should bring to ourselves and our families without getting caught up in all of the marketing and media that is coming at us nonstop and causing anxiety and stress? I think the term “non-judgmental awareness” is so very important to acknowledge, as we are so often judging ourselves and comparing ourselves to each other, especially this time of year. We can be harsh on ourselves, or we can decide to be Mindful and Accepting of the Present, bringing our focus towards what is truly important. The lists and obligations this time of year can seem endless and overwhelming. This is a good time to practice setting boundaries and giving yourself permission to say ‘no, thank you’ to invitations and extra requests. Sometimes, we need to catch ourselves from adding unnecessary ‘to-do’s’ on our lists, choose to focus on the items that you will feel joy in doing. Go to sleep at the same time each night and wake up at the same time each morning (including weekends). Keeping the same circadian rhythm is most healthy for your mind and body. Waking naturally to morning light is best. When you need to set an alarm, try not to hit the snooze. Snooze sleeping is not healthy as it is not true rest. Remember to leave the caffeine behind by 2pm. Exercise also improves sleep. Plan ahead for healthy food choices. Pause before eating. 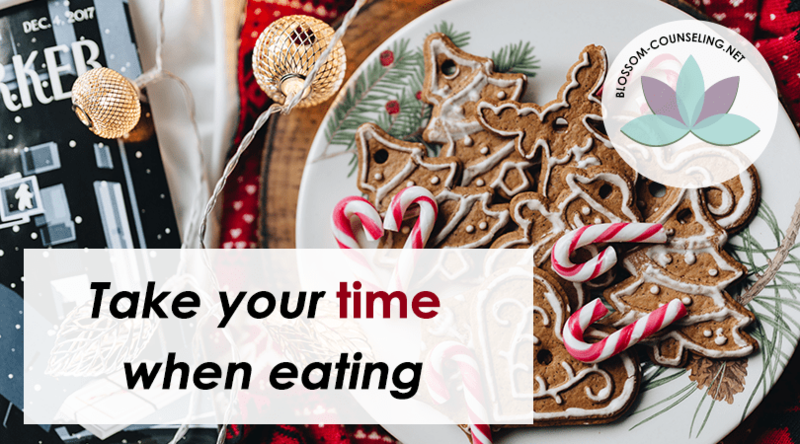 Take your time when eating; be mindful. Leave your work papers, phone and computer and come to the table to eat, even while dining by yourself. Pay attention to your breath; be more aware of it. When feeling stressed, focus on yourself in your chair in that moment: Feel your feet grounded on the floor, your back straight and look ahead, Soften your eyes, breath in through your nose and out through your mouth. Gently close your eyes and feel the weight of your body against the chair. Notice the rhythm of your breath as you breath in and out. Let go of distracting thoughts as you breath out. Continue until your mind and body feel calm, less tense, even relaxed. Through this holiday season, notice in your mind and body when you become to feel tense and stressed, be aware of where are you feeling it and put Mindfulness into action to give yourself peace and joy; you deserve it. 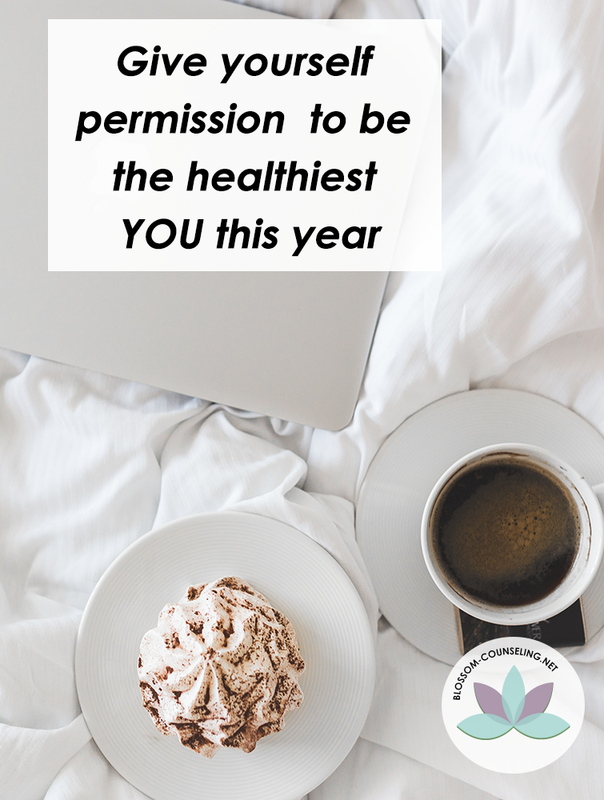 Give yourself permission to be the healthiest YOU this year – mentally, emotionally, physically, spiritually. Give yourself permission to slow down and take care of you and allow yourself to truly enjoy the present. Remember those around us are feeling it, too, be aware and sensitive and you will bring light, peace, and calm to their day, as well. November is a perfect month to start a Gratitude Journal this can help keep us stay focused on the present and the positive. Each evening, write three things that you are grateful for today. Debbie's clinical approach focuses on understanding, guidance, and inner peace. She places importance on self-care and mindfulness throughout the process of healing.